Insect activities are always a fun way to start the summer term! You can : GO ON A BUG HUNT, MAKE CREEPY CRAWLEY CREATURES, HAVE A SNAIL RACE, OR EVEN GROW YOUR OWN BUTTERFLY! There are lots and lots of books you can use, for this topic. The one I like is The Hungry Caterpillar but there is always The Bad tempered Ladybird which is just as good and can open up some interesting discussions on bad behaviour! 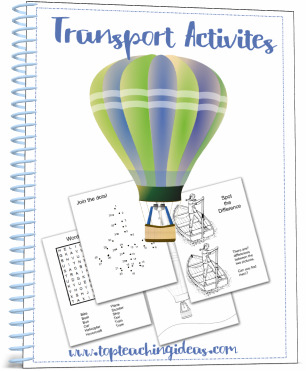 Also I have tried to include insect activities that address important strands of the preschool and kindergarten curriculum. Each of the tasks below have at least one learning objective and most of them can be adapted to fit individual ages and abilities. So please read on and ENJOY! A fun way to start your insect activities theme is to make a bug box so that when you go on your bug hunt you have somewhere to keep your mini-beasts safely while you study them. Younger kids might like to put plastic bugs instead of real ones in their boxes and use them in their play. What you do: First thing is to cut off any flaps so that the top is completely open. Then you need to cut a small flap or a door in the side, big enough to get the bugs in through. Next ,get the kids to decorate their bug box in any way they wish . 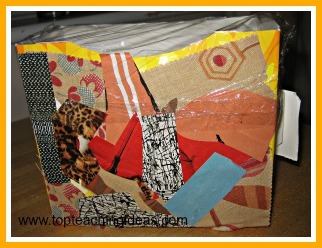 Paint is good but collage or cut out bugs or stickers are just as attractive. Then they can put on the see through lid and secure it with tape. Perhaps they could suggest something else they should do to allow air into the box so that the bugs can breathe! A sharp pencil is good for making holes. Lastly they have to make it a welcome environment for all the different types of bugs they might collect during their bug hunt. Ask them to suggest what kind of materials their bugs might like to live in and either have some things ready or go out and gather some! Then armed with their own little bug box you can go on your bug hunt! This wonderful insect activity was,I have to admit, borrowed from a friend of mine but is totally brilliant! It will serve as an activity that helps the small motor control if supervised and they can enjoy eating their caterpillars afterwards. A chopping board for each child. A knife that is not too sharp but sharp enough to cut a cucumber and tomato. Younger children might need help with the cutting. 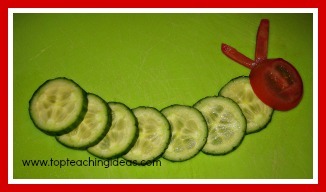 Ask each child to cut 5 or 6 pieces of cue for the body and 1 piece of tomato for the head and make them into a caterpillar shape. They might like to add eyes and feelers at the end to make it more realistic! Then they can eat it at snack time. Much better for them than a biscuit!! 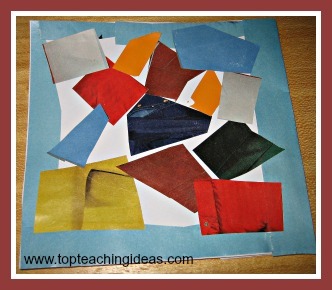 I have done this with both preschool and older kids and I have to say that the preschool kids produced a collage that was much nearer the original than the older ones! 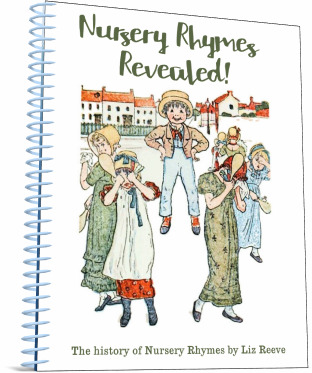 Partly because they still possessed the innate creativity that gets lost as we get older! For younger kids a large spiral drawn on a piece of white or coloured paper. Show the kids a copy of Matisse's Snail and ask them to tell you how they think he made the picture. Can they see the spiral shape like the shape on a snail shell. It might be useful to have had a look at a picture of a snail or perhaps a real one that they found on their bug hunt. Ask them if he overlapped the bits of paper or left gaps. Then allow them to create their own Matisse using the spiral shape to help them. I usually use this activity to create beautiful, colourful butterflies but I have since discovered that you can use the same method to create all kinds of unusual bug shapes! Pieces of white A4 paper folded in half. So simple is this insect activity but with such stunning results! 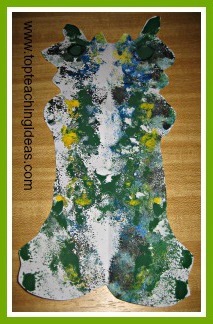 Just get the kids to blob different coloured paint down one side of the folded paper. Fold the paper in half pressing the fold down firmly to smudge the colours then open it up and see the result! Hopefully,they should find 2 or 3 weird and wonderful bugs to cut out when dry. Then they can add eyes and legs and feelers if appropriate. You can also point out how the colours have merged making it a great opportunity to learn about colour mixing. 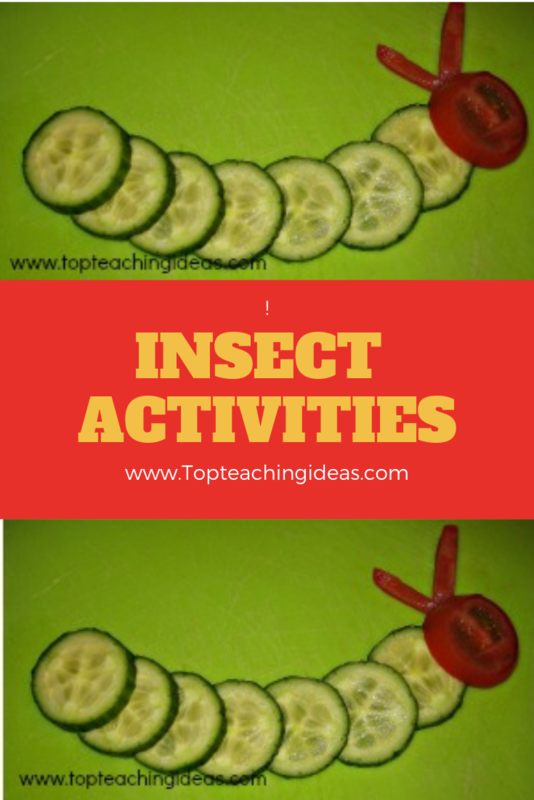 I hope you all have fun with these insect activities!